Asparagus is the cranberry sauce of the Easter meal. It’s there for color, and many, many people skerplop it out of a can. No judgment here, I swear. I’ve eaten my share of skerplopped asparagus with cheese sauce. But if you’d like to try something a little different, pick up some fresh asparagus, a box of frozen puff pastry and cheese, and make this Cheesy Asparagus Tart. 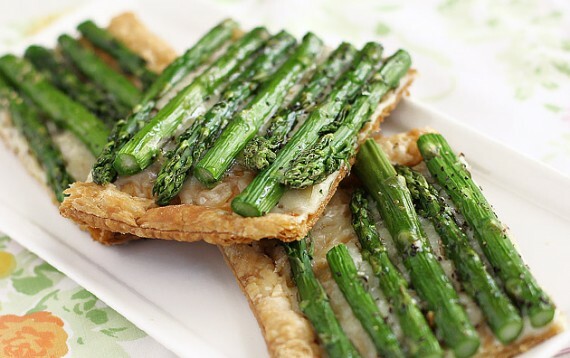 The seasoned asparagus gets tender but still has some bite, which makes it a great match for the salty melted cheese and the crisp, buttery pastry. It might be worth skipping a third roll for. If you’ve never messed around much with frozen puff pastry, it’s a gift from God. Leave a sheet on the counter to thaw for about 45 minutes, and it’s ready to go. For this recipe, you roll it into a slightly larger rectangle, grab a knife, and score the dough to make a one-inch border all the way around the rectangle. Don’t let the scoring scare you. It basically means that you’re using the knife like a pencil to gently mark the dough without slicing all the way through it. Once you’ve scored the pastry, you prick holes into the dough inside the border. Those holes let steam escape during baking, so the center stays flat while the border rises, giving you a nice pastry shell that will fence in the cheese and asparagus. Pair this tart with a big salad or cup of soup, and you’ve got a quick and simple spring lunch or dinner. It would also make a pretty killer brunch dish. A slice of Asparagus Tart topped with a poached egg? Go on with your bad self. Sprinkle your counter with flour, and place the puff pastry on top. Sprinkle extra flour on the pastry, and roll the pastry into a 16-by-10-inch rectangle. Trim the uneven edges with a sharp knife or pizza cutter. Use a pastry brush to brush off the extra flour. Carefully place pastry on a baking sheet. With a sharp knife, lightly score pastry dough 1 inch in from the edges to mark a rectangle. Using a fork, pierce dough inside the markings at 1/2-inch intervals. Bake until golden, about 8 minutes. Trim the bottoms of the asparagus spears to fit crosswise inside the tart shell. Arrange them in a single layer over Gruyere, alternating ends and tips. Brush with oil, and season with salt and pepper.